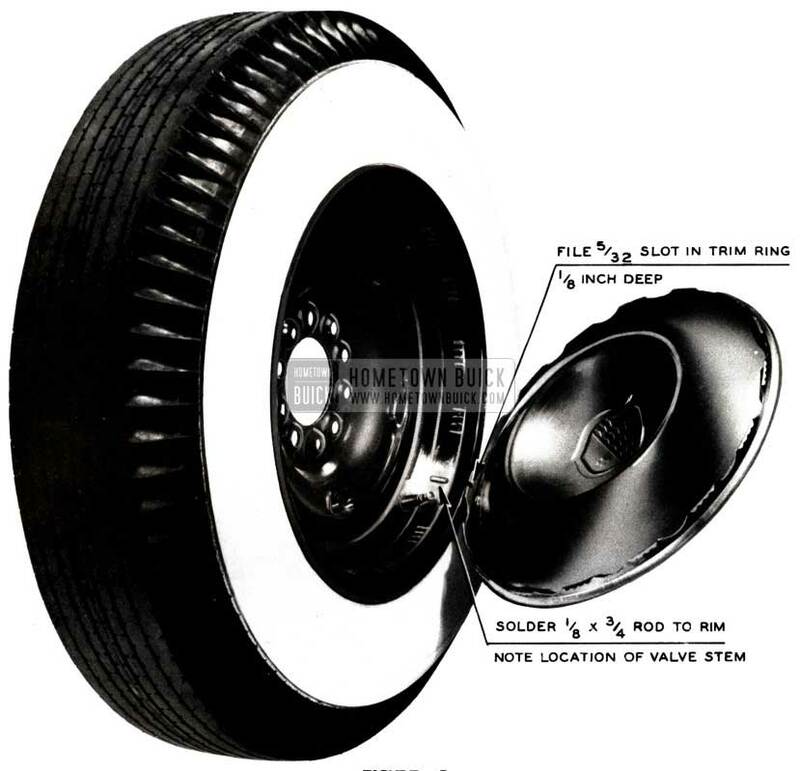 We have received a number of complaints to the effect that wheel covers on 1952 models creep on the wheels, causing the tire valve stem to be completely covered. In some cases, valve stem tension forces the cover off the wheel while the car is in motion. Locate the exact center line of the first set of cover gripper scratches to the right of the valve stem. In this location, solder a 3/4″ length of 1/8″ welding rod to the wheel flange as shown in Figure 47. File a 5/32″ slot, 1/8″ deep in the cover gripper that corresponds to the location of the rod (See Figure 47). Reinstall cover so that slot in gripper fits over rod on wheel flange. 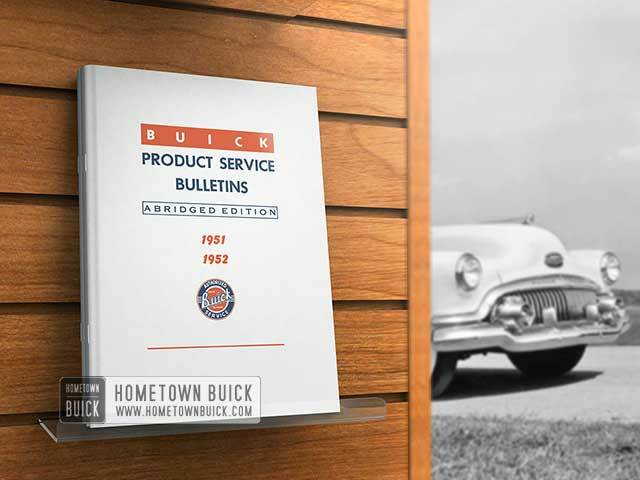 Examination of several rusted bumper face plates revealed that the parts had not been treated with Buick Chrome Preservative as suggested on Page 67 of this 1951-52 Edition. Upon questioning the owners of these cars, we were informed that they were not cautioned regarding the care required to keep current production chrome from rusting. Apparently, no one in the dealership explained the importance of keeping present day chrome clean and protected monthly with Buick Chrome Preservative. Nothing is accomplished by replacing the rusted chrome because the replacement parts are chromed by exactly the same process and with the same material as the original parts. See that the “Chrome Care” tag is left intact and delivered with the car (they will be released shortly). Additional quantities of the tag may be obtained from your zone office for installation on 1952 cars. The person delivering the new car should explain chrome care to the new owner. Service Salesmen should attempt to sell chrome care to the new owner. Use Buick Chrome Preservative 8.800, 981164. This product has been thoroughly tested by Buick Engineers and has their approval. It does not discolor chrome and is the best material we have found to prolong chrome lustre. Sell a can or two of Buick Chrome Preservative to owners who wash their own cars or have them washed at filling stations or independent wash racks. Establish a reasonable price on chrome care to encourage owners to purchase the service frequently. Thoroughly review the contents on maintenance of new type chrome on page 67. Request salesmen to cover the instructions on chrome care contained in the owner’s literature envelope in the glove compartment. If each dealer will see that chrome care is given the attention it deserves and must have, we won’t see many 1951 and 1952 Buicks on the highways with rusted chrome. Remove hood ornament from hood. Use a wood block, hammer handle or suitable non-scratching tool to spread the lower half of the ring assembly. (The right and left halves of the ring are pinned together and to the “bombed-shaped” center section). Grasp the rear end of the vertical fin with a pair of pliers and pull away from ornament. (The front of the fin will pivot around the lower ring assembly pin and disengage from the bomb section). Install a new fin by first engaging the positioning slot at front bottom of fin with the lower ring assembly pin. Use a plastic hammer etc., to securely seat the fin in the groove on the underside of the bomb section. Squeeze ring sections together in vise, being careful not to scratch the chrome. Make sure that the forward edge of the fin is correctly aligned with recesses at bottom joint of ring so that ring will close tightly. Some dealers are apparently having difficulty with the rear axle radius rod frame bracket when installing a new frame in 1950 and 1951 Model 72 and 72R sedans. The 1952 Model 72R frame is now being supplied as a service replacement for 1950 and 1951 frames. When using the 1952 frame it is necessary to also use the Group 5.418, Part No. 1343813, Rear Axle Radius Rod Frame Bracket and Pin, as listed for 1952 models.